The goal of this book is to provide practical solutions to save Africa and its people from an "African crisis" that is threatening to destroy the nation and eliminate human survival. The author, an African himself, argues that this crisis is manifesting itself in the form of social, political, and economic upheavals. He discusses major issues such as unemployment, famine, hunger, malnutrition, overpopulation, ethnic wars, power struggles, debt, democracy, colonialism, and corruption. He argues that Africa suffers from the exploitation of outsiders. 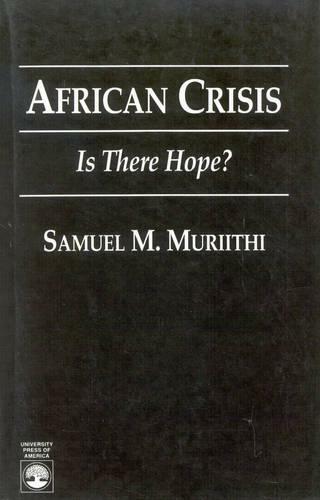 Based on this argument, Muriithi develops a strategic approach for developing Africa and bringing hope to its people. The study promotes that the three key determinants of African development are positive change in its society and culture, its demography, and its economy. The author suggests that through organization, discipline, education, and coalition, such changes can be made. African Crisis: Is There Hope? will serve as an appropriate text in African Studies courses focusing on the nation's problems, development, economy, and third world crises. This detailed and reflective work will also appeal to students and scholars alike, politicians, African development agents, donors, and world leaders.